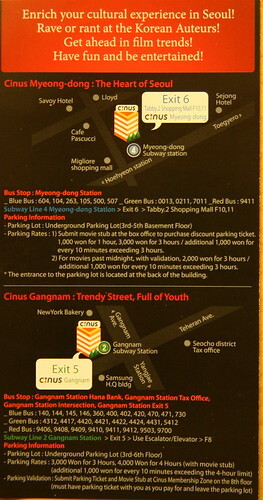 Thanks to a chance visit to Korea 4 Expats yesterday I found myself in possesion of a ticket to see a sneak preview of 그림자살인 (Private Eye) at the Cinus Cinema in Myeong-dong. Enrich your cultural experiences in Seoul! Rave or rant at the Korean Auteurs! Get ahead in film trends! Have fun and be entertained! As for question two, I felt the need to write in my own answer as none of the four options seemed adequate. Maybe Seoul Metropolitan Government are trying to tell me something... I'm just not sure. Despite these small mistakes the organizers' hearts were in the right place and I'm glad I got to see Private Eye for free. 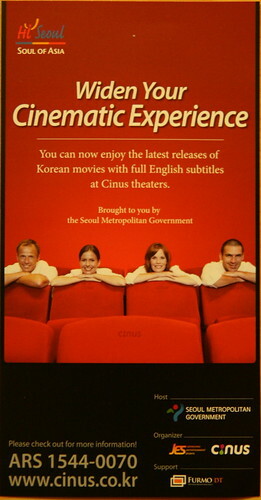 I hope that Cinus and Seoul are successful in their campaign to make subtitled films available to us all and that there will be a permanent home providing those of us who need assistance a place to enjoy Korean movies. Private Eye is a complex beast. It's a thriller, yet also a comedy and it borders on horror. Slapstick, violence and disturbing themes are blended together to form a story that Sir Arthur Conan Doyle might have written if he were born Korean and addicted to soju. 박대민 (Park Dae-min) fares well in his first outing as a feature length film director. While things may not fit together perfectly and some scenes leave the viewer a little more confused than they ought to; it's a good attempt at an old fashioned murder mystery with some twenty-first century violence thrown in for good measure. 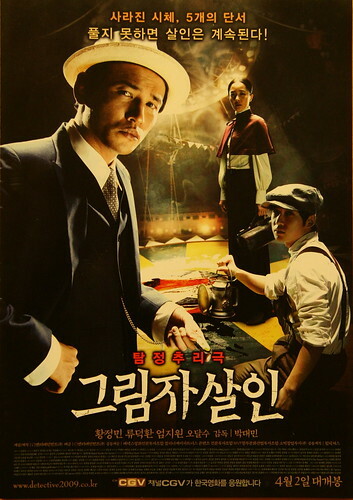 황정민 (Hwang Jung-min) excels as private detective/ scandal mongerer Hong Jin-ho. He walks a fine line between idiot and hero and provides us with a lot of the film's funniest moments. Almost like an uneducated Sherlock Holmes, he's able to divine the darkest of details when others are clueless. 류덕환 (Ryu Dok-hwan) ably acts alongside him as a clever, yet slightly bumbling medical student who calls on the detective for help. 엄지원 (Om Ji-won) and 오달수 (Oh Dal-soo) play supporting roles as a mysterious scientist and the chief of police. I don't want to give away any of the story as this sort of mystery is best seen with as little foreknowledge as possible. I'll just say that it is worth a watch, but only if you are prepared for some darkness with your light comedy and if you are willing to overlook some oddities from the first time director. Private Eye is a great opportunity to enjoy a traditional mystery while soaking up the feeling of early twentieth century Korea. The art design is gorgeous and you feel as if you have been transported back to that era. If Private Eye is popular and gets a sequel, I for one would be more than happy to be whisked away to Old Seoul and enjoy another mystery.